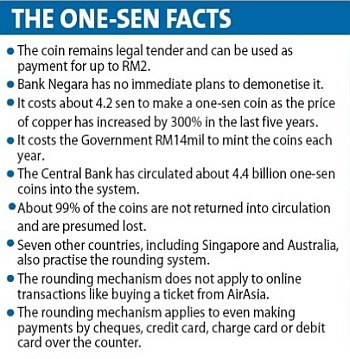 KUALA LUMPUR: It is no joke, but by April Fool's Day next year, you will not have to use the one-sen coin anymore. This is because the Government's rounding mechanism for over-the-counter transactions will be fully implemented by April 1. 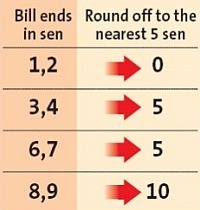 All payment totals will either be rounded up or down to the nearest five sen.
For example, if the total amount to be paid is RM82.01 or RM82.02, it will be rounded down to RM82. 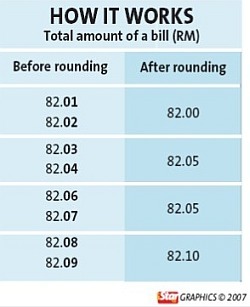 However, if the total that has to be paid is RM82.03 or RM82.04, it will be rounded up to RM82.05. Domestic Trade and Consumer Affairs Minister Datuk Shafie Apdal said this move would benefit consumers, businesses and the Government. “It will be more convenient for both parties. Businesses will no longer have to handle the coins or ensure a ready supply, while consumers will also not have to worry about carrying the coins,” he said. Shafie said talks were already under way with major retailers to recalibrate their cashier machines so that receipts issued would have an extra two lines denoting either a rounding up or rounding down. “It will also not affect the current price structure. Businesses can continue to charge RM29.99 or other odd numbers they are currently using,” he said. Bank Negara assistant governors Lilian Leong and Datuk Mohd Nor Mashor said there was a substantial amount of deliberation before the decision was made to implement the mechanism. Leong said they chose not to demonetise the one-sen coin immediately because they wanted to take a gradual approach. Leong said Bank Negara could reduce its production of the coin and once the market has “settled”, a proposal could be made withdraw the coin as legal tender. Mohd Nor added that the one-sen coin would continue to be legal tender and that businesses would have to accept it as payment up to a limit of RM2. Asked about the effect this mechanism would have on charities which rely on one-sen coins for their income, Shafie said he expected them to get even greater contributions as people would start giving five-sen coins. Malaysian Retailers Association president Toh Peng Koon said the move would help reduce some costs related with the handling and transportation of the coin while also reducing the reliance on it. “There have been shortages of the coin before and now this will no longer be an issue,” he said, adding that it costs RM3 for handling charges for one bag of coins and RM60 per trip that was made. Petrol Dealers Association of Malaysia representative Datuk Hashim Othman said most of the items sold at petrol stations were already rounded up but that he would suggest to the Government to allow them to recalibrate their petrol pumps. “We will suggest to them to allow us to make it such that the pump stops at multiples of five sen. 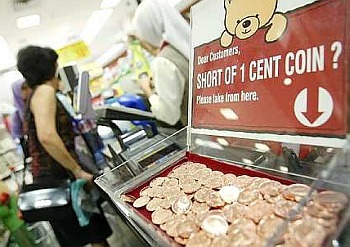 This would mean, for example, it would stop at RM20.05 or RM20.10,” he said. Fomca communications director Mohd Yusof Abdul Rahman said the move by the Government was a positive one and was one the federation had been calling for. National Consumers Complaints Centre director Darshan Singh went a step further and called for the one sen to be demonetised immediately so that retailers could not prey on consumers with their “99-sen gimmick”.